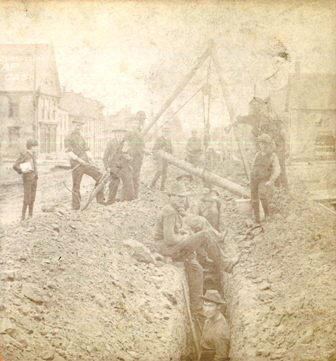 The Charlottetown Water Works Act was passed in the Provincial Legislature on the 7th May 1887 and a Commission was elected a month later on 6 June 1887. Commissioners included Hon. David Leard, Alexander MacKinnon and John Kelly. The Charlottetown Water Works was the design of Woburn, Massachusetts engineer, Marshall Martain Tidd (1827-1895). Tidd was involved in a number of water works projects in the United States and the Maritime Provinces. Local builder, W.H. Fraser, (who also built City Hall in 1888) built the structures. The project would include the construction of an Island brick pumping station with an 85-foot chimney, a brick octoganal well house and 15 and a half miles of pipe that led into Charlottetown. 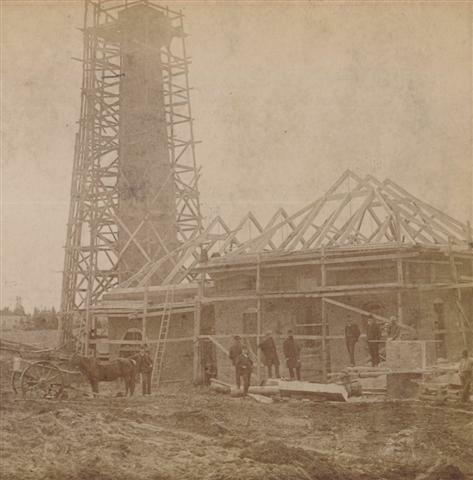 Nova Scotia sandstone was brought in to line the well, which is 25 feet in diameter and 21 feet deep. Two 120hp Blake steam pumps and boilers were used to pump the water from the well. 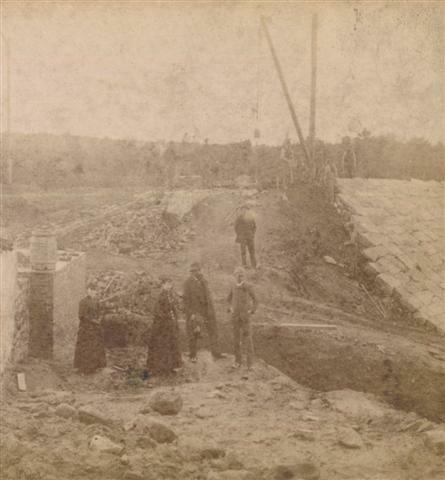 The Mount Edward Road reservoir was connected via force main directly from the pumping station on Malpeque Road. Mount Edward Road was 150 feet above tide level and the elevation of the reservoir combined with large sized mains would give sufficient pressure to throw water to a height of 60 feet anywhere in the City, which made the Fire Department and Insurance companies very happy. Unfortunately, due to its construction on sandstone and clay puddle lining, water escaped and despite repairs, the reservoir could not be kept full of water. Due to the fact that the top of the reservoir was never covered, it was open to the elements and algae continued to form despite efforts including pumping fresh water into the reservoir daily. In 1902, a new, covered, reinforced concrete reservoir was completed.